For the last seventy years, Flahive, Ogden & Latson has defended workers’ compensation claims before three state agencies and state courts at every level. Our practice is limited to workers’ compensation defense throughout the State of Texas. Eighteen of the lawyers in the firm have been designated as specialists by the Texas Board of Legal Specialization – seventeen in the field of workers’ compensation law. Our insurance carrier clients include six of the largest workers’ compensation insurance groups in Texas: The American International Group, The Hartford Insurance Companies, The Liberty Mutual Insurance Companies, The Travelers Insurance Companies, Texas Mutual Insurance Company and The Zurich Insurance Companies. We also represent a large number of mid-size as well as small carriers, many third party administrators, three self-insured groups, thirty-four certified self insurers, and approximately 2,500 cities, school districts, and other governmental self-insureds. 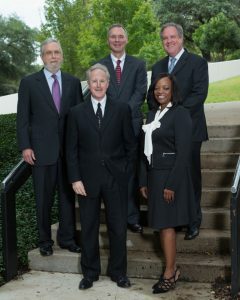 Among the lawyers in the firm, four of the firm’s lawyers were honors graduates, two were editors of their respective law school Law Reviews, two were selected by the Texas Court of Appeals to prestigious judicial clerkships, and one served as a clerk to a Justice on the Texas Supreme Court. One of the firm’s attorneys was a member of his law school national competition teams (moot court), and five are certified specialists in fields other than workers’ compensation (personal injury law, appellate law, and administrative law). 8911 Capital of Texas Hwy.